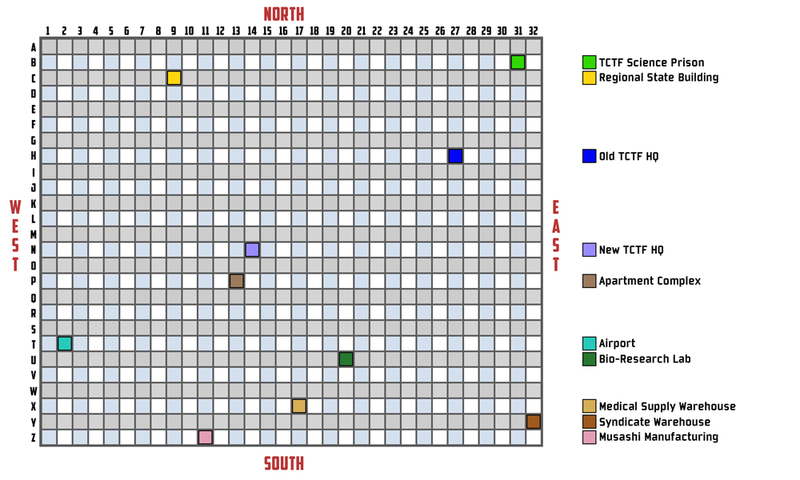 ...and it surprises me how big the maps are in comparison to the tiny confined spaces you're forced to progress through, especially on the Vago Biotech and TCTF HQ missions. There's a couple of tunnels in the back of the Biotech level that you never see in cutscenes, and they're fully textured. Bungie made such a detailed map, and only used like 15% of it. Maybe it was planned as some sort f overworld at one point? Or is it just there for excessive detail? What do you mean by "overworld"? Like New Mombasa in Halo ODST? Also, please give us screenshots. I'd say excessive detail. Halo is the same way. Based on some comments by the devs, I think it was a little from Column A, a little from Column B. Column A is Bungie not being sure exactly where they would lead the player, and trying different level paths. 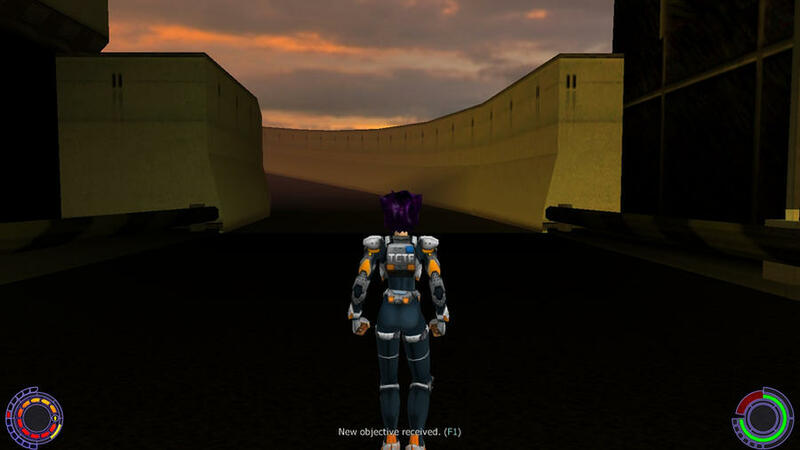 For instance, Airport had a whole segment cut out of it after they had made it, but if they had left that content in, and simply not allowed the player to go there, you would see the same unused space that you're apparently seeing in Vago. Column B is that apparently the modelers went above and beyond the call of duty and made overly-detailed levels. 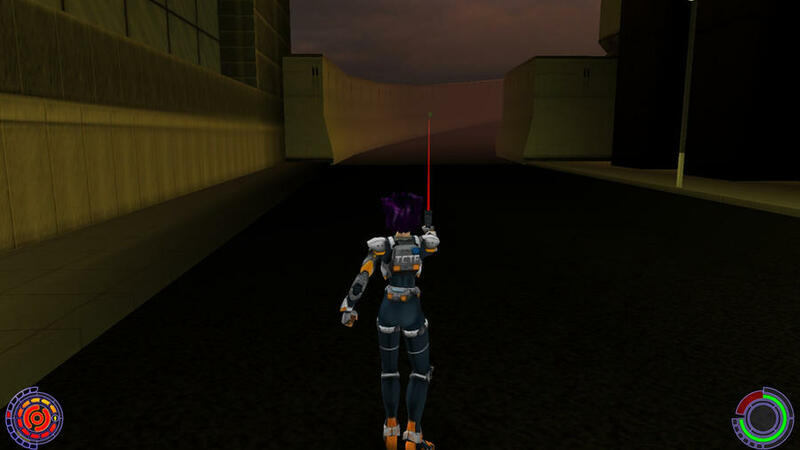 Screenshots of unused Vago areas. Isn't that where Muro escapes? I believe that's the part from which you ride your motorcycle into the main area where you fight Barabas. I came to the same conclusion some weeks ago. 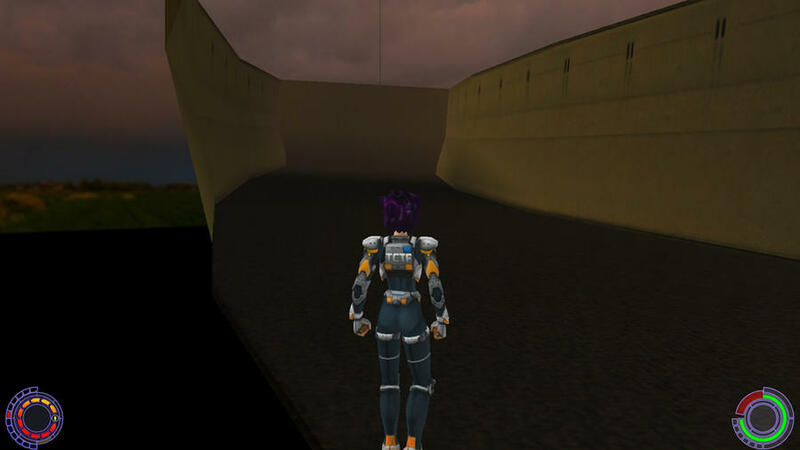 The maps are really huge, I remember using the god mode cheat and jumping off the TCTF building to explore the area just for fun years ago. Maybe some people here could use the maps, maybe add some stuff and create different paths and make some levels new? mm yeah i saw that when i first got the anniversary couple of years ago .. you should also see outside the regional state building .. there are a lot of snipers and black ops outside with weapons as if they meant for konoko to go outside before .. 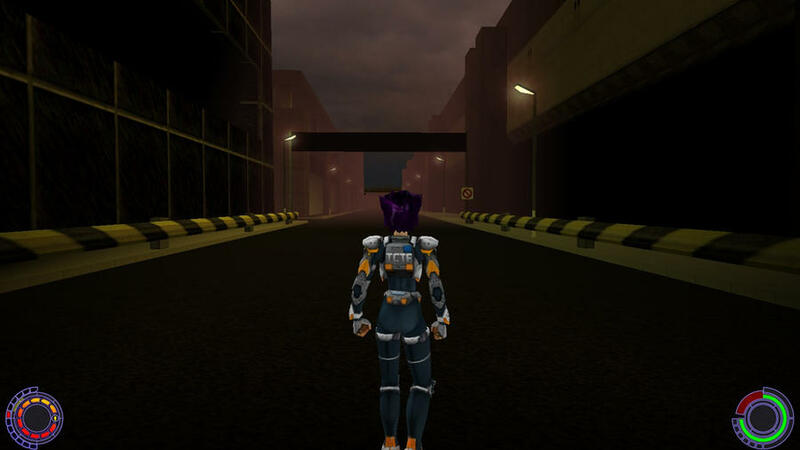 When I first bought the game and reached level 3 I thought you would control Konoko's motorcycle and explore the city in a later level, especially considering the size of some of the maps. Alas that level never came. It's quite easy to get outside to where the screen shots above were taken, even without cheating. When you reach the roof, take a hypo for full overpower just before jumping down onto the low roof behind the van; if you time it right and do a flip on the way down you'll hardly lose any health except the overpower. From there you can either go down onto one of the stairs behind the vehicle to finish the level (prematurely), or run along the wall out into the street to look around. 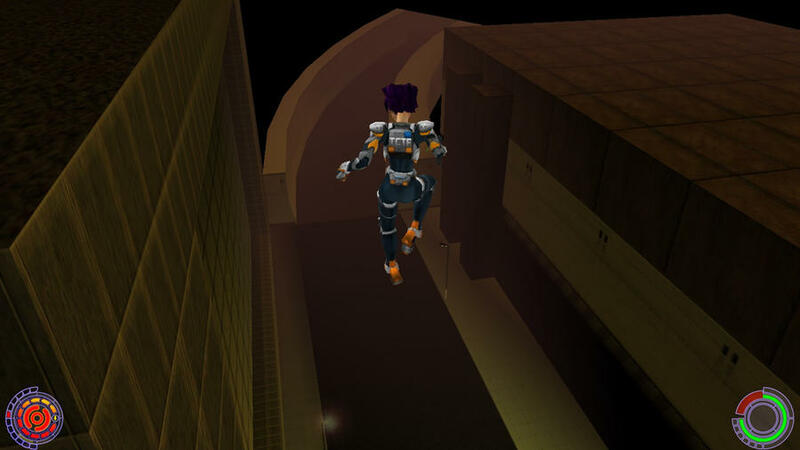 It is also possible to get back in: Run around to the gate, hop onto the foot of the wall to the left and from there run and jump-flip onto the tallest vehicle. Then run and jump-flip over the wall to get back where you fought Barabas. Not a good idea though, if you've died after you entered building because the door will be locked and you'll be stuck. Haha, wow. I haven't seen that before -- either jumping through the lab roof or through the wall (that one's especially embarrassing). Taking that fall using a hypo was first documented by Gumby, I believe. I wonder if we can use that flip to phase through other things in the game. After jumping through the roof you can also jump to the building at the other side of the start area. Just hop down between the roof sections and run to the end of the "tongue" and jump-flip across. I'll make a video of that some time soon, I think. In four more posts, I think you can post live URLs This is interesting, thanks for sharing (though I think you mean to say "Konoko", not "Oni" ;-). I'm surprised that the AIs run up to that barrier on the roof. Perhaps the pathfinding grid tells them they are supposed to be able to get through there (since the devs didn't pay attention to this part of the level). I'm curious, what did you do at 4:11 to get back to the roof? I tried but I'd always get sniped before I could do anything... well more like tried one time when I was younger and gave up because PS2 load times lmao. I'm curious, what did you do at 4:11 to get back to the roof? Oh, I just activated the "thedayismine" cheat. Then I jumped, and while still on the way up I pressed the rightmost key in the second row next to the ENTER key. On my Danish keyboard it has the signs ¨, ^ and ~ on it, I don't know what will work on an English keyboard. 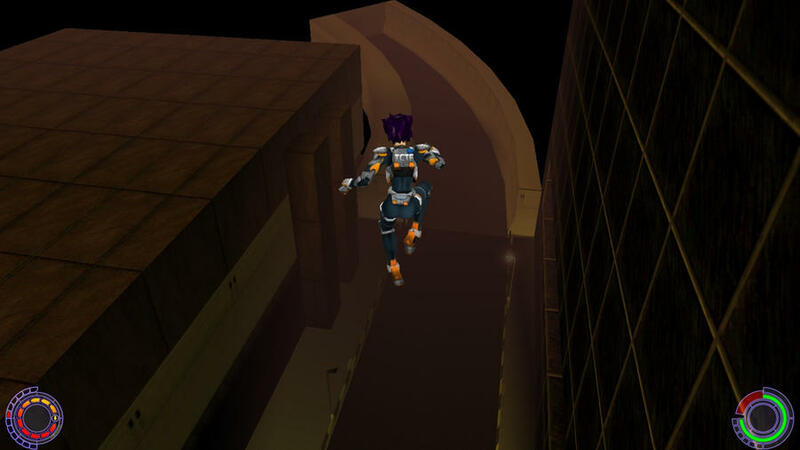 When doing that, Konoko will continue very fast in the direction she is moving - through walls, roofs, floors, whatever - until you press the same key again. So press again before she gets outside the map, or there'll be no saving her. Jumping upward absolutely vertically, no matter how high, she won't hurt herself falling down again. But jumping up at an angle is a different story. Activate both "liveforever" and "thedayismine", jump up, and when she's on her way down, press the ~ key, and she'll drop down through the floor. Press the ~ key again to let her land on a second floor down below. Now press ENTER. This will free the camera from Konoko. I think it will require a numeric keypad to move the camera around without moving Konoko: use the + key to bring the camera down, then use the 4-5-6 and 8 keys to move the camera around until you find the TCTF Training area. Use the - (minus) key to bring the camera up to Konoko's level and use mouse and the normal w-a-s-d keys to move her to the camera. Now press ENTER twice to attach the camera to Konoko again, let her jump, an on the way down press the ~ key to let her drop through the floor, press ~ again to let her land safely in the training area. Oh, I see! We had documented this on the Developer Mode page (it's the "]" key on QWERTY, and it's listed as the "~" key on QWERTZ based on input from our German friend paradox, so I guess you have QWERTZ? ), but I didn't realize the role that momentum played in determining where you would end up. That's useful to know. Now, when it comes to using Dev Mode to transport Konoko, keep in mind that the End key will always teleport you to the camera, so getting to the Training room can be done by simply finding the room with the free-flying camera and then hitting End. Thanks for the END trick. I don't know what this QWERTZ refers to - some joke maybe? My keyboard is a standard QWERTY. But in Scandinavia we have three more letters in the Alphabet, so the key next to the p/P is å/Å (Alt+0229/Alt+0197). So the [ and ] have been moved to AltGr+8 and AltGr+9. QWERTZ is a real thing used for German and other unrelated languages, so I thought you might have that. I'm a bit baffled by your description of the keyboard, is there a picture of it? I found this one that seems similar. If you can test the hotkeys listed on the afore-linked Developer Mode page and tell me which ones are different for you, then I could add your keyboard type to the table for the benefit of other users. It seems like the keys that are different are the ones that were moved; for instance on QWERTZ you press Strg-Shift-z for FPS instead of Ctrl-Shift-Y because "Z" is physically in the place of "Y". So the keys on your keyboard that are still in English QWERTY order should not be different.